If you're like me and heading out of town for the fourth, you don't have a lot of time to work on elaborate desserts. Here is a quick and simple one that's impressive in that not everyone makes their own sorbet and, with a few fresh blueberries scattered on top, you nail the patriotic theme with a red and blue dessert! Dissolve sugar in 2 cups of water over low heat. Add raspberries and remove from heat. 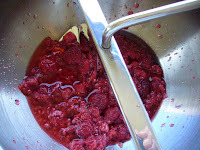 Stir mixture until raspberries are thawed and everything has cooled to room temperature. I prefer to pass the mixture through a food mill with the finest plate, but you can use a blender if you don't have one. Once the mixture is pureed (even if using the food mill) pass it through a fine mesh sieve to remove the remaining seeds. Cool in the fridge and then freeze according to your ice cream maker's instructions. 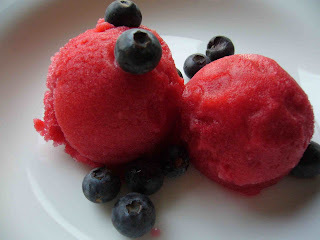 Serve the red raspberry sorbet alongside fresh blueberries and enjoy! Is it possible to make this if you don't have an ice cream maker? You can definitely make ice cream and frozen yogurt without an ice cream maker. It just requires a lot of diligence as you need to open up the freezer and stir the ice cream every 20 minutes or so otherwise you'll end up with a solid, frozen mess. When it comes to sorbet, you would be better off making a granita. It's very similar to a sorbet but you freeze it in a tray and pull it out every 30 minutes or so to scrape it. I'll make one soon to show you how. Thanks!